NASA’s Spitzer Space Telescope captured an image of Zeta Ophiuchi, a star that is traveling at 54,000 mph and is about six times hotter, eight times wider, 20 times more massive, and 80,000 times brighter than the Sun. The giant star Zeta Ophiuchi is having a “shocking” effect on the surrounding dust clouds in this infrared image from NASA’s Spitzer Space Telescope. Stellar winds flowing out from this fast-moving star are making ripples in the dust as it approaches, creating a bow shock seen as glowing gossamer threads, which, for this star, are only seen in infrared light. Zeta Ophiuchi is a young, large and hot star located around 370 light-years away. It dwarfs our own sun in many ways — it is about six times hotter, eight times wider, 20 times more massive, and about 80,000 times as bright. Even at its great distance, it would be one of the brightest stars in the sky were it not largely obscured by foreground dust clouds. This massive star is traveling at a snappy pace of about 54,000 mph (24 kilometers per second), fast enough to break the sound barrier in the surrounding interstellar material. Because of this motion, it creates a spectacular bow shock ahead of its direction of travel (to the left). The structure is analogous to the ripples that precede the bow of a ship as it moves through the water, or the sonic boom of an airplane hitting supersonic speeds. The fine filaments of dust surrounding the star glow primarily at shorter infrared wavelengths, rendered here in green. The area of the shock pops out dramatically at longer infrared wavelengths, creating the red highlights. A bright bow shock like this would normally be seen in visible light as well, but because it is hidden behind a curtain of dust, only the longer infrared wavelengths of light seen by Spitzer can reach us. Bow shocks are commonly seen when two different regions of gas and dust slam into one another. 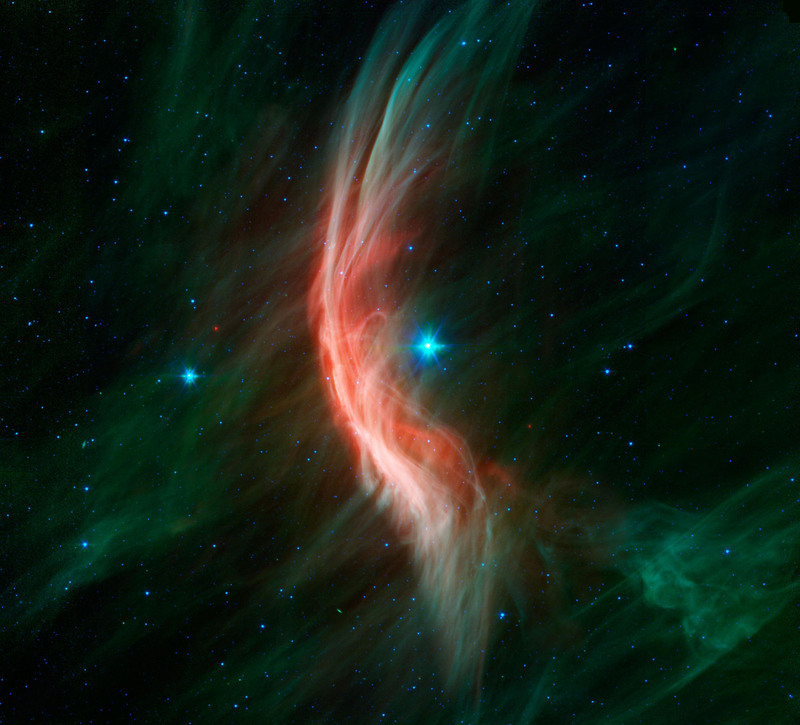 Zeta Ophiuchi, like other massive stars, generates a strong wind of hot gas particles flowing out from its surface. This expanding wind collides with the tenuous clouds of interstellar gas and dust about half a light-year away from the star, which is almost 800 times the distance from the sun to Pluto. The speed of the winds added to the star’s supersonic motion result in the spectacular collision seen here. Our own sun has significantly weaker solar winds and is passing much more slowly through our galactic neighborhood so it may not have a bow shock at all. NASA’s twin Voyager spacecraft are headed away from the solar system and are currently about three times farther out than Pluto. They will likely pass beyond the influence of the sun into interstellar space in the next few years, though this is a much gentler transition than that seen around Zeta Ophiuchi. For this Spitzer image, infrared light at wavelengths of 3.6 and 4.5 microns is rendered in blue, 8.0 microns in green, and 24 microns in red. JPL manages the Spitzer Space Telescope mission for NASA’s Science Mission Directorate, Washington. Science operations are conducted at the Spitzer Science Center at Caltech. Data are archived at the Infrared Science Archive housed at the Infrared Processing and Analysis Center at Caltech. Be the first to comment on "Zeta Ophiuchi, 80,000 Times Brighter Than the Sun and Traveling at 54,000 MPH"